If you owner of this device and want to Bypass Google FRP Samsung Galaxy J6, then you are here on right place follow the below guide to add a new Gmail ID and bypass frp verification to access your device home screen. to follow this process you need to download some files and need a working PC please follow all steps very carefully to Bypass FRP Samsung Galaxy J600 by Odin Flash tool. Warning:- This method is only for the Samsung J6 device owner. Note:- This method is successfully applied to my Samsung Galaxy J6 (SM-J600F).You can try and follow this method with your any Samsung J6 devices. We are not responsible for any damage on your Device. before you try this method backup your Full data and fully charge your device. Tools that you needed to accomplish this method are [ Computer / FRP tool / Combination Rom / Stock Firmware ]. In the latest security patch updates by Samsung, Samsung has Fixed all the old methods that help us to bypass FRP previous times like Bluetooth, Calculator Method to bypass Google Account… So here on this page, we Share the latest method only you a new Combination ROM and Stock Firmware and Odin tool to successfully Bypass Google Account on Samsung SM-J600F. Download all files below to Bypass FRP Samsung Galaxy J6. In the latest security patch updates by Samsung, Samsung has updated all the security patch level to the next level, Samsung.Inc has fixed all the old method that helps you to bypass Google FRP Samsung Galaxy J6, Now Samsung has fixed and updated all the old security patch level. old Methods that help us – Talkback method, Calculator method, Bluetooth Method, all methods are now fixed and not working now. -Switch off your Samsung Galaxy J6. -Now press and hold (Volume Down +Volume Down + Power) key together until you see the “Android logo”. -Release all the keys when you see “Android Logo” on your Device. -Then wait for few seconds to your device will enter into “Android Recovery Mode”. -There you will be able to see your Device Firmware Details. My device Firmware Version is J600FXXU1XXX. -Now note or write down your Firmware details, because we have to download “Combination Firmware + Stock Firmware” by matching with the code of your Samsung Galaxy J6 Firmware Code. See below image. -Now we can easily understand the firmware code, that’s what is our Android version and What is our Bootloader Version. -Download Stock Firmware Rom and Combination ROM to above your Samsung Galaxy J6 Firmware version according. -Now “Sign Up” with a free account on “Sammobile”. -After that, log in with your Account to easily Download “Official Stock Firmware Samsung C9 Pro”. -After that, Click on “Firmware” tab from the Top bar. -Then type your device “Model Number” or search for it. -Then Select your Device country. -Then download the “Official stock firmware” by matching with the firmware code that you wrote down. Note:- Make sure you have to download latest Android -8.0 version Firmware, or if your Device has more latest Updated Android Version then you need to download same Version latest Firmware. -Once download finish, then copy the downloaded Stock firmware to your desktop. -Download Samsung Galaxy S9 Plus Combination File from below Download links. -Download Samsung J600F Combination File from here. -Download Samsung J600G Combination File from here. -Download Samsung J600GT Combination File from here. -Select the correct Combination Firmware code by Matching your Device Firmware Code. Note: If the last 3 digit of the firmware code is not matching with your device Firmware code, So don’t worry you can still download the Combination Firmware, but make sure, Android Version, Model Number, Bootloader version is matching. -Once downloading finish, Copy the downloaded combination firmware to your Desktop. -Now first extract the downloaded “Combination Firmware” to your desktop. -Then open Extracted folder – there you will able to see 1 file. -Go to extracted Combination file folder. -Then Remove “MD5” extension from “Combination File”- simply Just by renaming it. -Because we need only the “.tar” extension to flash. -Then Install Samsung USB Driver. -Lets Flash Samsung Galaxy J6 Combination File. -Now extract Odin tool to your PC. -Click AP- Select AP File [File On Extracted ‘Combination Rom‘ folder]. -Give their file path of extracted Combination file folder. -First Power off your Samsung Galaxy J6. -To enter into the download mode, Press, and Hold (Volume Down+Home Key+Power Key). When Boot Your Device Release All Keys…Now Next Step to Confirm -Press Volume Up Key to Confirm Download Mode. -Now you have successfully entered into the download mode. -Connect Your Device To PC [USING USB CABLE]. -Now open Odin tool. there you will see on Odin tool “ID.COM” turn into Blue Color. that’s mean your device has successfully detected in Odin Tool. -Now Click Start Start Button. -Then your Flashing will be Start Automatically. -When its finish flashing – then you will show “Pass” sign in Odin tool. -Your device will auto entered in “Factory Binary Mode”. -Once your device power on. -Then you will access the “Factory Binary” home screen. -Then go to the settings menu. See Below Image. -Then go down and tap on “About Device”. -Then tap on “About Emulated device”. -Tap Build number 7 times. until you see “Developers Version. -Go Back to the Settings Menu. -Open “Developer Option” Scroll down and enable “USB Debugging Mode On”. -Open “Developer Option” Scroll down and enable “OEM Unlocking”. -Then back to “Factory Binary” home screen by tapping back button. -After that, tap on “IME” in middle down option list. -On the Calculator screen type the following code there “*#0808#*“. -Now open USB Settings, Just Select “AP”. -After that select also this “DM+ACM+ADB“. -All done just tap on Reboot. -After your Samsung Galaxy J6 reboot just waits for power on your device properly. -Download “Samsung ADB-FRP Bypass” in your Computer. -Extract Samsung ADB-FRP Bypass tool on your Computer. -Then a CMD Screen opens on your Computer. -Connect Samsung C9 Pro on your Computer. -Then Samsung C9 Pro Asks you to “Allow USB Debugging” – just tap on Ok.
-Simple Press Any key from keyboard to Bypass FRP Samsung Galaxy J6. -Disconnect your Device to Computer. 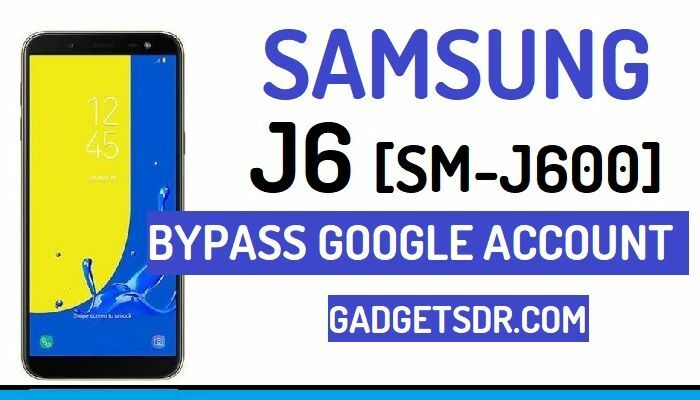 -Now Flash Flash File on your device to Bypass Google Account Samsung Galaxy J6. -Now extract Samsung Galaxy J6 Stock Firmware On your Computer. that you downloaded from “Sammobile” website. -Once extracted there you will see 5 stock firmware files. -Power OFF and Put Your Device in “Download Mode”. -Click AP- Select AP File [File On Extracted flash file folder]. -Click CP-Select CP file [File On Extracted flash file folder]. -Click CSC – Select Home CSC file [File On Extracted flash file folder]. -After the all files has selected. -Click the “Start” button to start flashing your Samsung Galaxy J6. -Wait some time for the finish. -When Finish Flashing a Green box with “Pass” Massage will appear on Odin tool’. -Power On your Samsung J6. -Now complete the initial setup of your device. -Now you have successfully Bypass Google Account Samsung Galaxy J6 done. Thanks for visiting us, Comment below if you face any problem With Bypass Google FRP Samsung Galaxy J6 (SM-J600F), we will try to solve your problem as soon as possible. you can check other some tutorial here to help you.